Liljana and Luka are tending to Ivan's grave. Lil has bought some flowers, which Luka places on the grave. Luka asks Lil what he was like. Lil says she's already done that but Luka wants to hear it again. Lil says he was a wonderful man. Luka asks if he didn't leave would she still love him? Lil says it doesn't matter any more, she loved him with all her heart, but she was lucky to get another chance of love and to have a family with David. Life goes on. Sindi is on the phone to Carmella discussing her next assignment – fashion for women over 45 – saying there is no such thing, and have you seen what they wear? Meantime Susan is at the counter (Sindi has her back to Susan) hearing the conversation and is none to impressed, to say the least. Eventually Sindi turns round and Susan smirks at her – Sindi say's she will call Carmella back. Sindi tries to say she wasn't talking about Susan, and how much of the conversation did she hear anyway. Susan says enough, and wants Sindi's comments on what she is wearing whilst reminding her that she helped her pick half of her wardrobe. Sindi tries to wriggle out of it by saying she wasn't referring to Susan but all the other unfashionable women. SUSAN:(to Sindi) Quit while you're ahead. Stu is saying goodbye to someone (Susie) in a departing taxi. Toadie starts ribbing him about his flings that he's been having lately and wants all the gory details whilst they get the shopping out of the car. Stu says Toadie should go on the pull since he is a lawyer, and if he were single. Stu also adds he would take a relationship over a fling any day. Toadie says it's fun (being in a relationship) but try keeping up with the maintenance – cue Sindi's arrival. She tells Toadie she made a fool of herself in front of Susan and he explains to her about Stu's flings. SINDI: Is that what you want? A whole string of meaningless affairs? TOADIE: No. Absolutely no, I've got everything I need right here honey. 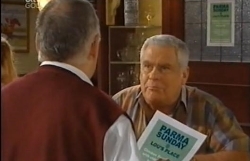 Harold is moaning to Lou about his new promotion – Parma Sunday. Lou explains he's selling cheap chicken parmesano for $5 each. Whilst they are still arguing, a ‘boganess woman' comes in “having been on the frog and toad since ten in the morning” and is flat knackered and wants a cheap feed. Lou mentions his new promotion, and she says she wants one along with “a glass of chardy but nothing too fancy”. Lou gloats to Harold about the diners not letting blasphemy get in the way of a good feed. Lil and Luka are back from the country. David enters with then saying he's sorry for Luka's loss, mentioning losing Kerry 15 years ago. Luka asks if he knew her, David says yes, Luka then replies that he has no idea how he's feeling and heads to unpack turning down David's offer of a cup of tea. Lil tells David it was awful at the gravesite. David says she must have been helpful just being there. Lil says she lied again to Luka about how his father was, but David says it's better than actually knowing the truth, “that he was a gutless no hoper”, but Luka has heard what David has said as he is stood in the doorway. Toadie is in collecting a pizza when his mobile goes (Stoney is on the phone). Lou comes in wanting more cheese because the "boganess woman" is causing Mary hell that (in his best bogan accent) “there isn't enough cheese on me plate”. Harold scoffs and quotes a phrase from the bible at him but Lou just wants his cheese. Toadie (whilst on the phone to Stoney) is looking at a ring (an engagement type one). Lou spots it asking Toadie if there is news to tell him about asking Sindi to marry Toadie. Toadie vehemently denies this, saying it isn't his style. Stingray enters and Toadie leaves, and Lou tells Stinger all about the ring, again inferring that it's to do with Toadie and Sindi. Stinger truly believes what Lou is saying. Serena joins Luka (who's holding a box of matches) on the balcony of No 24 saying “it's not a good look for someone who's committed arson.” Luka asks what she's on about. Serena replies “people might get the wrong idea”. Luka asks if there is anything else “princess”. Serena turns and heads down the stairs whilst Luka shouts at her “you can hate me you know.” She says she doesn't, but he doesn't care, her dad too, it's all the same to him. “You know why, because my parents shared something special. Me and my mum are connected you know. By blood. By love, and you can never change that. Serena just keeps walking down the driveway. Harold comes in with more supplies bemoaning that Lou should have ordered in before staring the promotion. Lou tells him to be quiet saying the punters are loving it. LOU: The punter is always king Harold. You would do well to remember that as long as the punter is happy you have nothing about. 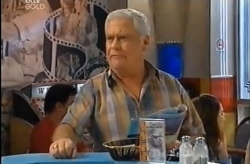 HAROLD: And what about my punters? Meanwhile ‘boganess woman' comes to the bar demanding her money back because there is a hair in her food. Lou fishes it out and says it's hers because none of his kitchen staff has dark roots. She says, “you calling me a liar”, whilst Harold pips up “customers are always king eh Lou”. Lou tells him to keep out of it. She's still demanding her money, but Lou is resisting since she's ate most of it anyway. She says it's the only meal she's had all day and if she could afford a proper meal she'd go out and get one. Harold drags Lou away to have a word. Harold says to be sensible; it will be bad for business if she makes a scene. Lou says she's trying to rip me off (in the background she steals a bottle of wine from the counter). Harold says to give her a meal voucher to come back again so she can spend money on drinks, take other with her. Lou thinks he's onto something there and gives her a meal voucher to use next time. Stingray is doodling on a napkin (Sindi loves Toadie) when Serena walks in, and he knocks over his glass of OJ. She wants his advice on Luka since he's been acting strange and nasty. Stinger agrees with her. She tells him about Luka looking at the car playing with matches. Stingray cracks a joke, but Serena says he freaks her out. Stingray says Luka must still be confused about finding out about his mum and to give the guy a chance. Susan has shown Lil the card that accompanied the flowers Alessandro sent Libby. Susan say's she is proud but jealous too. She then mentions what Sindi said earlier and Lil says wait until she (Sindi) has a couple of kids and her spare money goes on the kids instead of the latest fashion. Susan says she looks well for her age, which Lil compliments her on and says the divorce knocked 10 years off her age. Lil mentions having an 18 year old son which Susan counters by saying wait until your kids have kids. Lil say's she is worried about Luka. She thinks he wants bond more than she wants to have just now, and how difficult it is too for David and Serena. Susan advises patience and cake! The ‘boganess woman' has now appeared in TCS and is trying to tempt Harold into having a cosy chat for two. Harold wriggles out of it as Lou comes in and tells Lou he's going to write a letter to the church bulletin about his promotion. The two of them argue while ‘boganess woman' is removing a bit of a muffin. Harold gives Lil & Susan their coffee and enquiring how it went with Luka earlier. ‘Boganess woman' now tries to trick Harold into giving her, her money back, saying “this muffin is a stubby short of a six pack” and wants he money back. Harold spots that she removed the bit of muffin. This time it's Lou's turn to gloat, as she tries to get her money back whilst making a scene, by saying reminding him that the customer is king. Harold agrees to a refund. Stingray comes in and Sindi asks him what he knows about fashion for the mature lady. He's got a funny (I know something you don't know) look on his face. He starts asking her questions about her relationship with Toadie. She says fine and that they are going away for the weekend. He eventually says that Toadie is going to ask her to marry him. Sindi has a shocked expression on her face. Sindi still looks shocked. She asks Stingray if that is what he said and she wants Stingray to tell her everything. He says what occurred in TCS and reckons that he will ask this weekend. Sindi has an even bigger shocked expression on her face and Stingray is hyper. But he reminds her she must looked surprised when he asks. 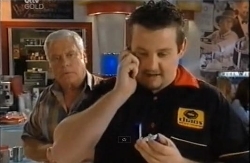 Toadie is on the phone to Angie saying he's got the ring and that he will courier it down asap. Stu comes in enquiring about the ring thinking that he is going to propose to Sindi. Toadie tells the ring is for his brother. Lil and Harold are cooking. David comes in asking if anyone has seen his briefcase. They all suggest places where David could have left it, he says no to each suggestion. They start making jokes about David's predicament until David says there was a present in there for Lil. The allotment Meanwhile outside a briefcase is on fire with Luka standing over it, staring into the flames. He eventually leaves with the case still burning away. Sindi is now dressed in Susan type clothes in preparation of writing her article. Sindi: Fashion for the over 45's does not suit me by Sindi Watts. SUSAN: Well why would it you're in your late 20's. They discuss her article for the magazine and Sindi thinks Carmella has got her, when it is actually a real article she has to do. Stingray comes in and banters with Susan, when there is a knock on the door. Susan goes to answer it and the ‘boganess woman' has appeared on Susan's doorstep. Scott turns round and sees it's his mum and runs to hug her. Susan looks stunned.